The Saturday 10AM trip on the Voyager out of Redondo was pretty awesome. There were at least three Gray Whales in the area, though some fog made it a little difficult to spot them, we did follow one for a little while. 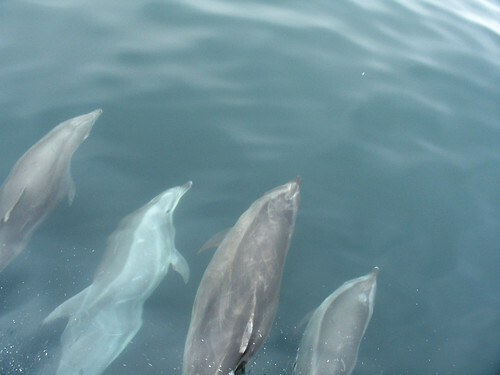 The best part were our encounters with two different groups of Offshore Bottlenose Dolphins. Offshores are often darker and much larger than the ones seen close to the beaches. There were at least three individuals I saw in the pod of 30 that were probably 14 feet long (instead of the 10 foot long Torrance coastal pod that are usually seen along Santa Monica Bay beaches). The Northbound Gray Whale Migration is hitting its peak. Yesterday the Census saw 24 even though they were socked in with fog towards the late afternoon. Sunday may have been the peak at 29 sightings. That brings the season tally of Northbound individuals to 281. Several Humpback whales have been spotted around Pt. Vicente this past week, including a spectacular adventure when the Voyager followed one for a while on Monday and it even breached two times. Monday the Census also noted a mega-pod of Common Dolphins (10,000 individuals) and some Fin Whales still in the area. Previous PostPrevious OMG! Downtown Film Crew Actually Helpful!